"Let yourself get swept away. That's the fun of it." French cinematic icon, Gérard Depardieu first cast his spouse, Elizabeth, opposite him in his 1984 directorial debut Le Tartuffe, and she would play his wife in 1985's Jean de Florette and its sequel Manon des Sources (Manon of the Spring). For his second directorial effort, Depardieu again plays opposite his partner in the role of his wife, this time That Obscure Object of Desire's Carole Bouquet. 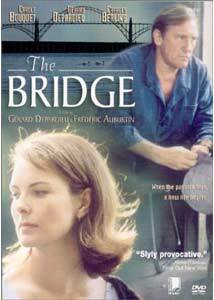 Based on a novel by Alain Leblanc, The Bridge (Un Pont entre deux rives) tells the story of an adulterous housewife in a small provincial town in the 1960s, where secrets are hard to keep. Mina (Carole Bouquet) is a wife and mother, who spends afternoons at the matinee with her son. Her husband Georges (Depardieu) is out of work, so when she is offered a job as a maid for Claire Daboval (Dominique Reymond), she accepts, knowing that her husband's pride will be hurt. At one time he ran his own company, but now, to save face, he must set out to regain employment, and an out-of-town construction project building a new bridge could put him back into a job. It would require him to live away during the week, but would allow him to be home for weekends. One afternoon while watching a film, the man next to Mina and her son begins crying in response to the film, and after the presentation they spark up a conversation, which leads them all out for a drink. The afternoon is jovial, and Mina, who imbibes a bit too much, dances with the stranger. When she and her son return home, their afternoon activities are left unspoken, but Mina finds herself drawn to the man. She and Georges have been married since they were both young, and the excitement of this new relationship is too much for her to resist, and with her husband away she pursues the affair, much to the objection of her son, who finds himself in an uncomfortable position, trying to protect his father from the truth. However, a small town can only keep its secrets for so long, and Mina will have to face the consequences of her actions at the risk of her marriage. With a husband and wife joined by matrimony, but existing independent of each other, the bridge could be seen as a metaphor for the force that bonds them, or the building of a bridge as a means of reunification. The son could also be the bridge that spans their disparate worlds, holding them together despite the torrents between them. Here though, the structure seems merely to serve as a way to remove Georges from his residence, facilitating Mina's affair, while bringing in the young engineer who will become her lover. With a style that is typically non-Hollywood, The Bridge struck me as many foreign films do, enjoyable while watching, but leaving me scratching my head at the conclusion. Not that this is necessarily bad, but here, even though there is a conclusion, the sense of unresolve felt extremely anti-climactic and unsatisfying. Throughout the film, we examine the central characters, but their actions don't really fit with what we've seen. Bouquet's Mina wants nothing but to make her son happy, yet places him in a situation where he is forced to lie to his father to conceal her adultery. The chemistry with her lover, played by Charles Berling, isn't tenable, and doesn't justify her choices. While the relationship with her husband is certainly distant, she appears as the type who would forsake all else to hold her family together. Depardieu also has an enigmatic quality, and his reactions don't quite mesh with what we expect. Perhaps this is the whole point—that we can't know what to expect from each other—but there seems to be a depth of emotion missing on all levels here that would sway our acceptance of the situation one way or the other. I felt rather indifferent, not really caring what happened when all was said and done. The performances are fine, and as I mentioned, had the ending been different, I probably would have come way from this with a better opinion. The cinematography has a nice air to it, and the setup for the story had promise, but just didn't gel. This was an enjoyable time waster, and had my attention until the last third, but I'll not be crossing this bridge again any time soon. Image Transfer Review: The anamorphic transfer is free of major defects, exhibiting good color saturation, and solid black levels. Colors have a period feel, and come off warm and natural. There is some minor aliasing on horizontal lines, and a few compression issues in dense backgrounds, but otherwise this is a very nice presentation. Audio Transfer Review: Stereo French audio is well presented, with a pleasing soundscape, good dynamics and good definition across the stereo spectrum. Frequency coverage is suitable, with no excess sibilance, and clear dialogue. Extras Review: A standard extras set is included, with the theatrical trailer, filmographies for Depardieu, Bouquet, Berling and Auburtin. A link for Winstar's newsletter is provided. G&eracute;rard Depardieu's second directorial effort leaves me somewaht disappointed after a promising lead-in. The look and feel of the film are enjoyable, but the the after effect is one of vapid engagement. The performances are enjoyable, but the characters lose credibility for the sake of the plot, and the focus loses perspective in the final frames. I didn't hate it, but it doesn't rank with some of Depardieu's better efforts, due soley to the story.